Hello folks. Just wanted to drop a quick line to say hi. We are heading into San Antonio this Thursday morning if you need us to bring in an order of anything. Holler at us on the company line (no texting) 830-305-7925. 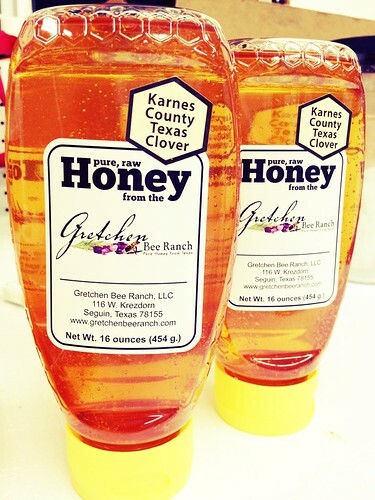 Also, check out what Mark and Stan bottled this year…it’s been a while for the larger sizes of local honey. This is nice to see. I love that we have jars from cute little 2-ounces to the 5-pounder. Cool and fun for us. I might have missed the beautiful lines that boards make when stacked and the character of each board’s surface, telling of weather conditions here in South Texas. I might never have known that bees have happy hour as well. I might have freaked out if I saw ghost bees, especially on a night such as this. I could go on and on but I’ll say goodnight here. 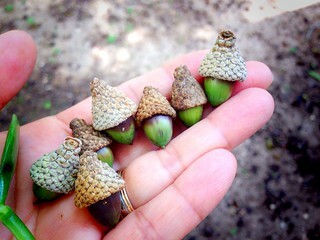 Earlier today I was thinking about these things I have enjoyed seeing and so I just wanted to share them with y’all. Hope you’ve had a great day and a safe one most of all. Sleep well and talk to you again soon. 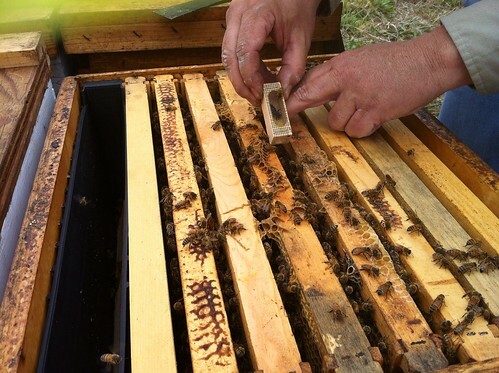 Thanks go out to Emily of the UK for putting the idea of introducing a queen to a new hive without the cage – an aggressive approach compared to our seven-day slow introduction method with a caged queen that has proven to work quite well in our hives. I came home today and when Mark got home, he surprised me with news that he and Danielle requeened a hive using the cageless introduction technique. Cool! 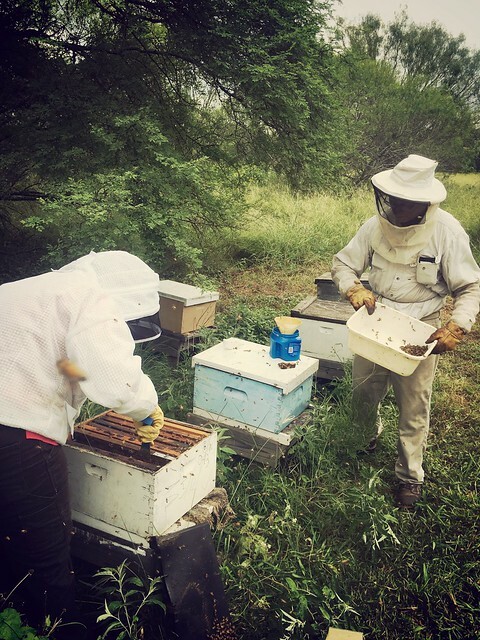 He said while they were out in the bee yard feeding, doing mite treatments and dividing when they came across one of our new Jester Bees hive. 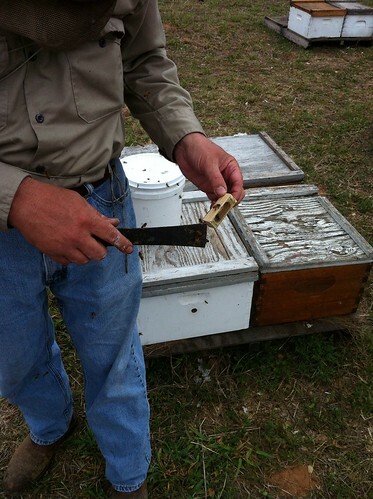 That hive had lost its queen and the girls made their own, which Mark does not want here in Texas. So, he decided this was an opportunity to try the more aggressive approach – doesn’t hurt to try and I guess his curiosity had been piqued. First things first, he found and killed that queen the girls made for themselves. In the following picture, he is clearing off the attendant bees from the Big Island queen, as best he can. 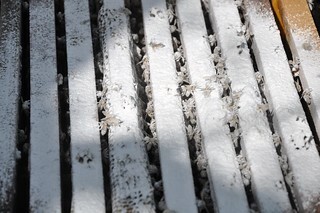 After that, he put a very heavy smoke on the hive itself to really sedate them. Don’t worry, it won’t harm the bees. Here he is pushing apart a couple of frames to make sure that when he releases her, she’ll be near or on the brood nest. And there she goes when he pulls back the wire protective screen. After all that, he put some feed into the box for them and now we wait and hope. He will go back and check on them next week some time. Thank goodness! While we have yet to measure between two and six inches of rain forecasted, we are still very happy to finally get a downpour today at the house as well as in the surrounding area. 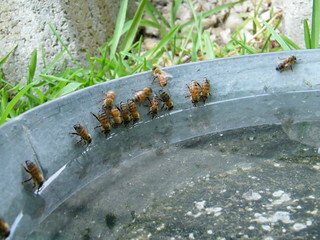 If we can get a bit more rain here and there, then the bees will be in good shape for honey production in a couple of months. Already! It seems like it was really just last month that we were trying to figure out how to extract all the honey. Time sure does fly by sometimes, doesn’t it. 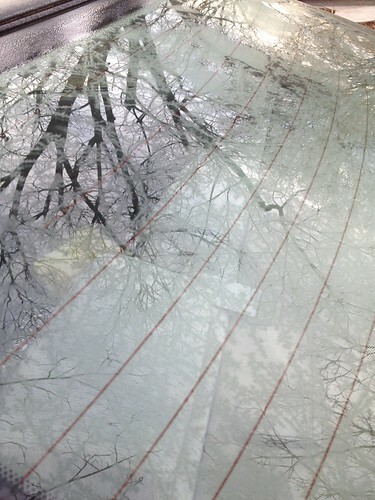 The picture above is my car yesterday morning when I left for work. Lot of moisture in the air lately, which is a nice change from the dryness. As I type (sipping yummy coffee and looking at the Christmas lights we still have up b/c life is too short not to enjoy Christmas lights for as long as we want), Mark is out in the candle shop still, getting some more pine cones out of the molds. If you follow us on Facebook, the other night I posted a picture of three candles we are trying things on – different wicks, different pouring technique, etc. We’ll let you know how things progress. I don’t have much to report at the moment besides the fact that Mark just brought in more to test so yay for me! It rocks to have your very own candle maker. I personally think the candles are fine but he has very high standards so if he sees just one thing he doesn’t like about it, back into the pot it goes. Or to me if I see it in time. 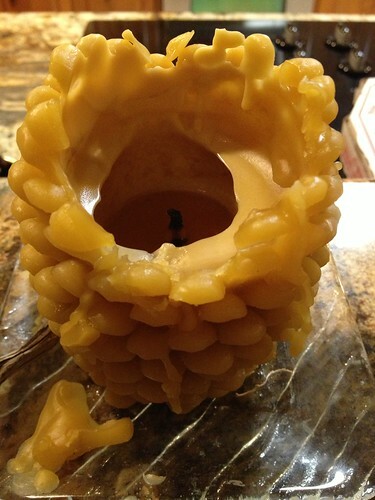 Here’s one of my favorite melting candle patterns. I love the pit that is being created. I also love the smell of the wax. I’ve decided the hollowed out pines make a nice little container so I’m saving them once they burn down to about an inch. Fun, pretty, functional. Good stuff. In other news, during dinner conversation tonight, Mark casually told me that today Apivar was approved for Texas and that he’s really excited because it looks like it has proven to be very effective for mite treatment overseas, where they’ve been using it for a few years now. I thought this was great news so I wanted to share that with y’all. When we get some in and use it, we’ll be sure to post about it. This product is less messy than Hopguard and is a slow-release so it will hopefully kill the mites more effectively than Hopguard and Apiguard, both of which killed mites that are there already but not mites that come after application. So be on the lookout, fellow beekeepers! If you have mites (and you’re bound to), then you want to stay on top of this product development. Weather alert: It’s raining hard again and I hear thunder. NICE! Oh, now coming down very hard. Exciting. This is going to be great for the bees! We just looked at the rain gauge again and now it measures about 2 inches. Radar is showing quite a lot of storm movement so hopefully we’ll get more rain overnight. For allergies (like I’ve been having lately since I’ve been enjoying too much non-Guadalupe Wildflower), do a daily teaspoon of whatever’s local for you. You can do it straight or in your tea, coffee, oatmeal, other cooking. For sore throats, I mainly do a cup of hot tea with honey and 1/2 a lime or lemon in there. There are tons of variations so you can alter as you wish. This one was always great when Mom made it for us. 🙂 You can also try honey and cinnamon which is a popular combination. Some people take it in tea while others take it in milk. Typically it’s one teaspoon of honey and 1/2 teaspoon of cinnamon. I’ve also read a recipe that adds ginger to that so I’m going to try that soon as I like ginger for settling my stomach when it’s out of sorts. Hope you are all well and whether you are or you aren’t, you should probably still have some local honey daily as it is just an overall great food for overall great health. Sleep well and have a great day tomorrow! 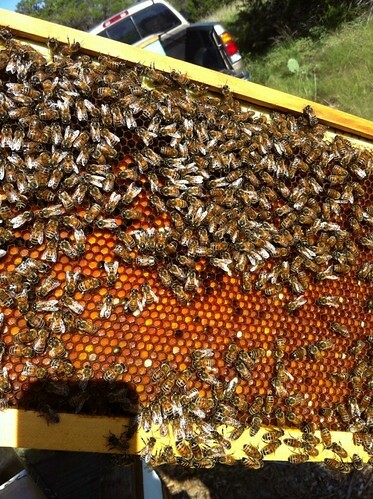 Today was a gorgeous day out there – nice day to work the bees, not too hot. While I was in an office listening to the breeze whip bush limbs against my window, Mark and Stan were busy, busy. Stan’s got a whole lot of our honey bottled and ready for markets, class and other events coming up. What a great help and a great space saver for us. I actually was able to move freely around the Honey House after work as I met a customer and then did some work there (although my flowing skirt kept catching on the bottling tank valves, hehe). Anyway, that gorgeous frame at the top of the post is from the Pizza yard and I think it’s absolutely gorgeous. It’s a shot like that – of the perfect frame – that makes me wish I was there with him with my big camera. The colors are gorgeous. 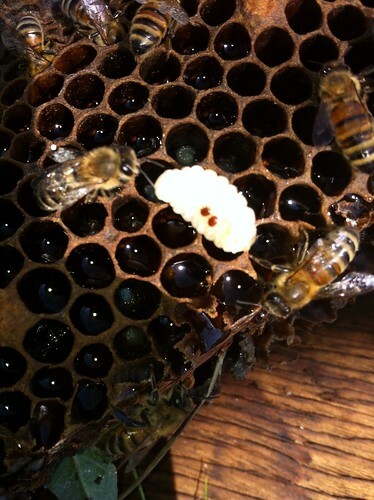 That’s brood in the center followed by a ring of pollen and then honey. The bees are doing very well at the Pizza yard and they made some fantastic honey that I got to taste this evening. Thanks, girls! Now, below is a shot of two of the five mites Mark spotted on the poor little larva. 😦 This is why he’s treating with Mite Away. To put this in perspective for people during our bee classes, Mark tells students to imagine a tick the size of a FOOTBALL on your back – just sucking the life out of you. YUCK. Now imagine five of them. 😦 I am so sad just thinking about the poor bees. Let’s hope the Mite Away does its job well and helps them out a bit. So far, so good with the treatments. Let’s end on a good note, shall we? Mark also visited the Marriott again and was pleased with his check of the treatment he applied earlier. Then he sent me this shot and again I marveled at the beauty of the bees’ work. 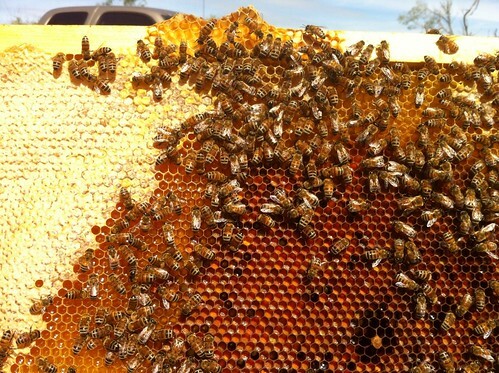 Gorgeous frame of pollen and bees. It takes so many little pouches of pollen to fill each one of those cells…can you imagine how many foraging trips it took the bees to fill one cell? And then all the cells on one frame? 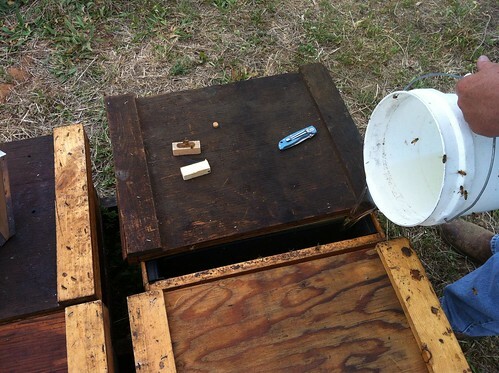 And then the other frames in one bee box? 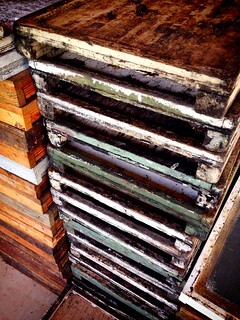 And then the other boxes stacked on the colony? That’s a lot of work. Okay…so we made it through our BIG double event weekend. Not just any double event but the three-day event also known as Come & Take It. It didn’t disappoint overall though the crowds were thinner than in years past we noticed. We talked to other vendors and they agreed. We did, however, manage to do good business there. Some new things for us include the very new, very nice, surprisingly easy to put up and take down canopy from Academy. Weighing in at 65 pounds each, these have an extended awning that provides much needed shade from the Texas sun, both for our customers as well as our candles. In the four years we’ve been doing this whole market thing, we have learned a lot and we continue to with each event. Our neighbors have helped by providing feedback and suggestions on everything – from how to place products on tables for optimal appeal to how to set up the various canopies we’ve had (and some have even helped us put up that dreaded double canopy that didn’t last long). We sure appreciate the advice and help. 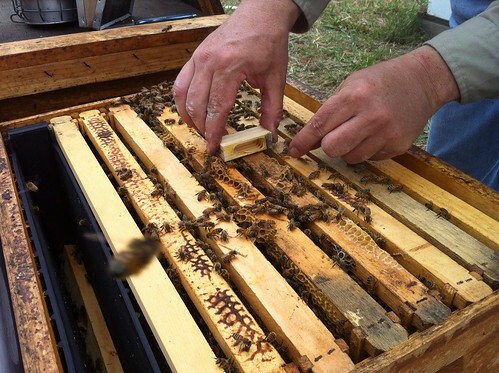 Finally, I want to catch you up on Mark’s work in the bee yards – it’s not all dividing and requeening right now. I think we need to clone him. Just a thought. Anyway, he is treating for mites! Yes, the dreaded mites. You really have to stay on top of them and he has yet to find a treatment that he is satisfied with but for now, he’s reading up on Randy Oliver’s site about Mite Away and trying some suggested methods of dealing with them. Randy does a lot of great research on all things bees and their well-being. We really appreciate his efforts as well as those of the groups with which he works. We had a chance to hear his presentation at last year’s beekeeping conference and it was fascinating. So, if you’re keeping bees, then be sure to do what Mark is constantly doing – reading, experimenting, reading, reading and more reading. And you’ve got to check your bees to stay on top of any potential problems, particularly at the height of activity (summer time). Right now we’ve got to get them ready for winter and that means helping them kick the mites off and out. So as I mentioned, Mark’s using Mite Away, a white strip of formic acid (don’t worry, this is considered to be an organic treatment). It sure smells better than Hopguard. Just my opinion. Okay, now I’m off for tea and my honey cookie! Ciao! Now that Mark is back full time, there’s a lot of catch up work going on. Here’s an update on some of his activities since he got back to GBR. 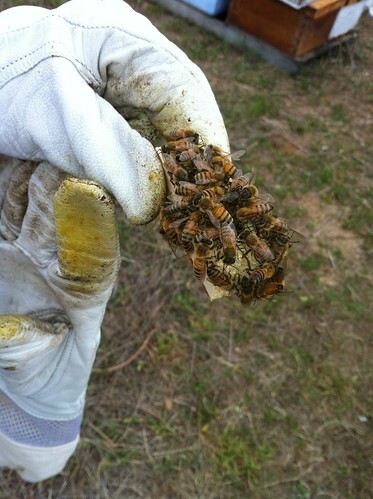 Coyote Bee Yard: We lost one hive there and pulled a couple of honey supers still left there. No coyotes spotted. And no goats either (as we normally see and/or hear). The Farm Bee Yard: The picture above is from the Farm yard. 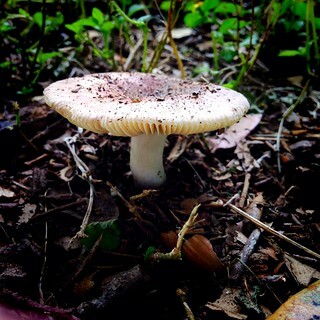 I haven’t been out there in a while with Mark so he snapped this for me. 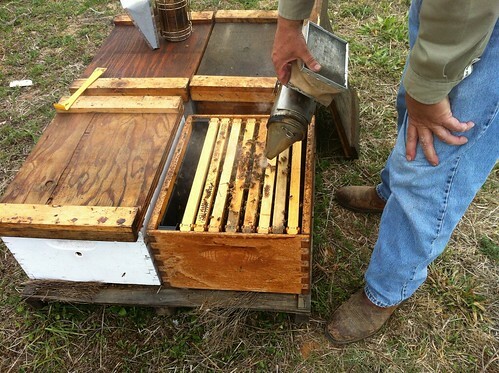 He pulled about ten honey supers off the hives there and looking forward to extracting them. 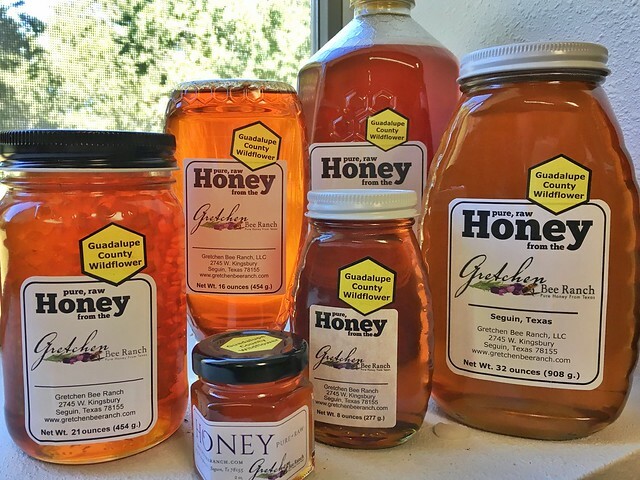 It’s been amazing what this year has yielded in our honey production and we are very happy and thankful for it all. 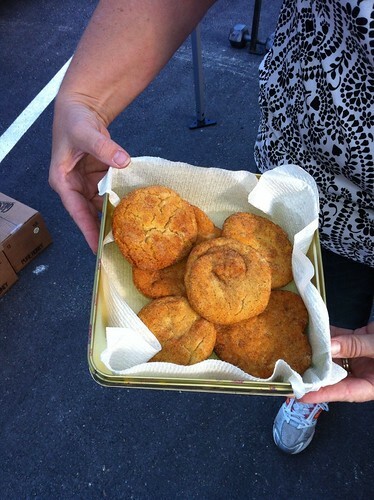 Restocking: Mark has restocked at Ta’s in Marion as well Lily’s Cookies in SA. Also got that order to JW Marriott for the trip up to New York City (You must say this in that Texas cowboy twang like on the salsa commercial – I wonder if I drive Mark crazy sometimes saying that. I can’t help it. Our honey is going to NYC and it’s exciting and fun! And for some reason that makes me use a twang.) 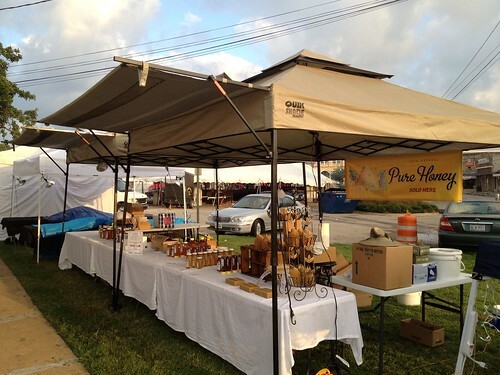 Back to business – there should also be a good supply at Gift & Gourmet here on the town square of Seguin. 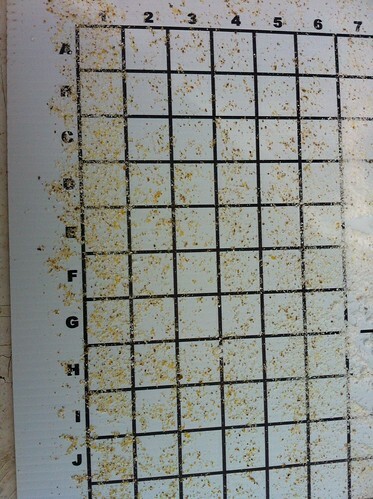 Hopguard: It’s time to treat the bees for mites so Mark begins the rounds tomorrow. 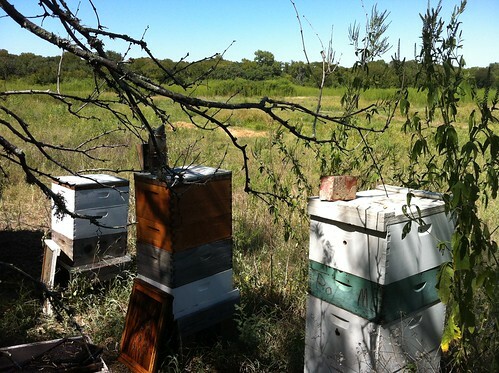 Elm Creek is first and then he’ll just continue on with the rest of the bee yards. No more powdered sugar treatments at this time. Visit GBR website – $10 Shipping! 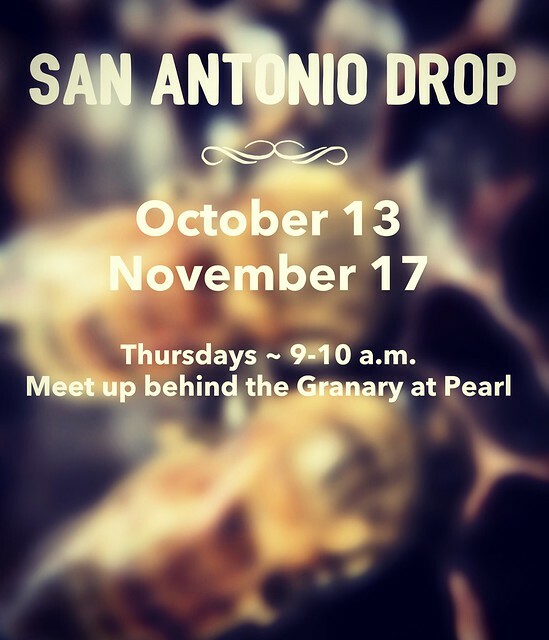 *Please bring your veil and gloves if you want to join the group in the apiary for this demo.